Palazzo Ravellese holiday home is part of a small historic palazzo located in a very panoramic position right in the heart of the historical centre of Ravello. The apartment is positioned on the 3rd and last floor (35 steps, no lift) of the palace and offers picture-postcard views from almost every window. The apartment is very centrally located, less than 5 minutes walking distance from the main square of Ravello, Piazza Vescovado. The apartment is 140 square meters and hosts up to 5 persons. It features two panoramic, private terraces. The larger terrace, accessible only from the main bedroom, boasts one of the most beautiful view of the sea, of the bay of Amalfi and the surrounding villages that are scattered along the hills and valleys which have beautifully tended gardens and terraced fields, the most photographed view that has made Ravello famous all over the world as the town “suspended between the sky and the sea”. 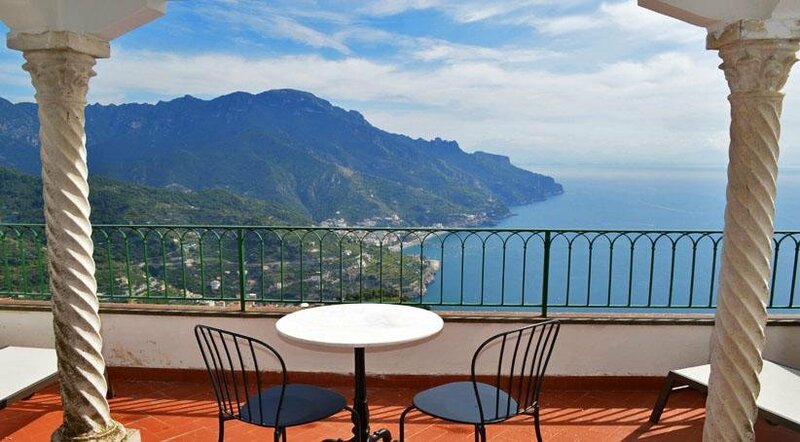 The roof top terrace enjoys a wonderful view of the town centre and of the Medieval town of Scala, situated in the hearth of the Lattari mountains and the winding Dragon Valley which separates Ravello from Scala. The house has been recently restored maintaining its original charming character but adding all modern comforts to include new electrics, plumbing, Wi-Fi Internet access, A/C, winter heating, new kitchen equipment and utensils. Perfect setting for a family holiday or a romantic escape for couples. Accommodation: 140 square meters indoor + 2 terraces 15 square meters each. Access is into the bright, spacious open plan living room which is paved with handmade majolica tiles. This room has vaulted ceiling, the furnishings are elegant and refined and include some antique pieces, a sofa, a desk and a TV. There is an age-old and impressive fireplace. The dining table can accommodate six guests. The room has large panoramic arched windows with a view of the sea and of the coastline. From the living room, 4 steps takes up to a double bedroom which comprises a double bed, a large wooden wardrobe, a chest of drawers, bedside cabinets, an age-old fireplace (for decorative purposes only) and two windows with a view of the sea. From the bedroom, a French door leads out onto the first terrace (about 12 square meters large). The terrace is equipped with a coffee table with chairs and two sun-beds. From the terrace you will enjoy a wonderful view of the sea and of the coastline. A large kitchen equipped with a four-burner gas cooker, an electric oven, a dishwasher, a microwave oven, a washing machine, an Italian-style coffee-maker, an American-style coffee-maker and other small appliances. Separate dining room with a refrigerator with freezer, a table to seat six guests, an iron and an ironing board. Both rooms have windows with a view of the sea. From the dining room, indoor stairs (approx. 11 steps), lead to the rooftop terrace. The terrace is shaded by an elegant awning which gives shade to a table suitable for dining outside while enjoying a wonderful view of the sea, of the town centre and the surrounding hill town of Scala. One bedroom has a double wrought iron bed, a large wooden wardrobe and a double-glazed large panoramic window with view of the sea. The second bedroom has a single bed, a wardrobe, a chest of drawers and two windows with a view of the greenery and the sea at a distance. The 2 bathrooms are outside the rooms, to respect the villa´s historical architectural plans. The first bathroom is equipped with a washbasin, a toilet, a bathtub with shower wand and a hairdryer. You will be able to enter the bathroom from the living room. The second bathroom is equipped with a washbasin, a toilet, a fully enclosed shower and a hairdryer. You will be able to enter the bathroom from the corridor through an access area. Access: The apartment is located on the top floor of the building (no elevator). You will reach it from the main entrance of the building going up two flights of stairs (approx. 35 steps). A car is not required to stay at this holiday house. If you do have one, you will be able to park it, for a daily fee of € 15,00, in a private parking lot offering valet service. Facilities: Washing machine, dishwasher, satellite TV, DVD player, CD player, winter heating and air conditioning throughout, Wi-Fi internet connection, fridge, freezer, electric oven, hairdryer in each bathroom, ironing facilities. Service - Beach 6 Km. (Atrani or Castiglione) - Restaurants & Bar 200 m. - Shops 400 m. - Bus Stop 300 m. - Motorway 22 Km. Cites - Ravello centre: 200 m. - Amalfi: 7 Km. - Positano: 26 Km. - Sorrento: 39 Km. - Salerno: 30 Km. - Napoli: 55 Km. - Roma: 273 Km. Attractions - Pompei Excavations: 33 Km. - Paestum Excavations: 75 Km. - Vesuvius Crater: 55 Km. - Capri Island: connected from the port of Amalfi 7 Km. Airports - Naples Capodichino - 59 Km. - Roma Leonardo da Vinci 287 Km. - Roma Ciampino 261 Km. - Bari 274 Km. Railway Stations - Salerno - 30 Km. - Sorrento 39 Km. Check-in time is between 4,00 and 8,00 p.m., from Monday to Saturday. You will be met and taken to the booked accommodation, asked for a photo copy of your Id or passport, any extras and the Breakage deposit (in cash only in any currencies) € 500,00 – this is refunded on your departure day, less any breakages. Household linen and service: Mandatory, € 120,00 per week, payable locally in cash. City tax: Mandatory, is € 3,00 per person, per day, payable locally in cash. Electricity, gas, water and A/C consumption. Bedroom and bathroom linen (weekly change).